This lovely photo was taken at CNF this summer by vacationers from Spokan Wa. 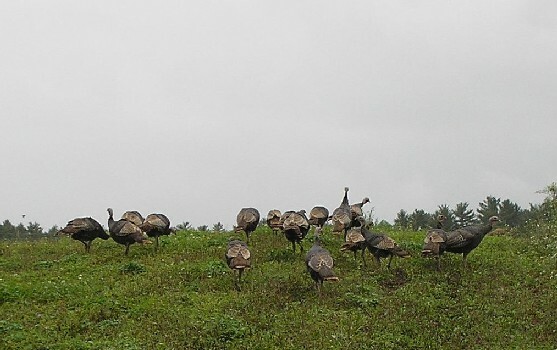 What do you call a group of 2 dozen wild turkeys? Puttering around the farm on Sunday, no other people here, just me and the goats and sheep and cows and chickens. Sometimes I actually think I hear people voices when the air is still and everything is quiet except for the movement and voices of the animals. I was scrubbing and disinfecting the animal’s food and water dishes (a task set aside for Sundays and one day midweek), when I thought I heard people voices outside the goat area. It frequently happens that people do come to visit the goats and sheep, or bring table scraps to the hens. There is often some chit chat with the animals and to each other. So, I went to find out who was there. Then I noticed some movement near the fall planting of peas and lettuce. It was a huge flock of wild turkeys. I had seen them near there once before but they had gone straight into the woods the other time. This time they were lingering near the peas. I couldn’t tell if they were actually pecking around in the peas but I did not want them to do that so I made some noise: some hand clapping and several of my loudest diaphragm – dredged “HA!” s . The turkeys did not seem to be concerned about my presence. They took their sweet time moving! Did they know there was a fence between us which I wouldn’t be very quick to scale in order to chase them away.? Maggie and I frequently bemoan our short stature while noting that farming is for tall people. I watch with admiration as our son Nicholas and especially our helper David -at 6’2’’, effortlessly hop the fences with alacrity, displaying the ease and grace of our barn cat Simba. It is an awkward and slow-pokey struggle for me; and I think the turkeys knew it! They finally moved on. They were an unusually large group, and since my next task brought me near the car, I grabbed my camera to see if I could maybe capture the group to share with you. Of course, once camera was in hand, they became scardey cats and scooted into the woods. I went about my business and when I finished my next task, I checked on them and lo and behold they were picking around in the compost pile. I was curious about whether they’d get into the tomatoes or greens. No standing still for this group. They moved constantly and steadily. I wondered if they were headed to the bean patch on the hill and prepared to chase and stomp and yell them away. Fortunately they didn’t appear to be interested in the beans. They went to the right toward the compost windrows. I followed them all the way up and actually snapped a few photos along the way. It was fun and I could-a followed ‘em all day! Wonder if they were on their way to the cranberry bog. Do the cranberry growers consider wild turkeys a nuisance? Never found out because I heard children’s voices down below: goat visitors… gotta go see who it is!